Zhang Liang's countryside and family having been destroyed by the Qin, Zhang attempted to gain revenge by assassinating the emperor. When this failed, he went into hiding in Xiapei, which happened to be Liu Bang's home region.5 One day while walking by himself Zhang Liang saw an old man deliberately drop his shoe down an embankment. The old man asked Zhang to fetch it, then put it on him. Zhang Liang swallowed his initial resentment and did it. In return the old man, later known variously as the Grand Duke (Taigong) or Lord of the Yellow Stone (Huangshi Gong6), said Zhang Liang could be taught, and asked him to return at dawn five days later. When Zhang Liang did so the old man was already there, berating him for being late. This was repeated three times until Zhang Liang finally got there at midnight. At this point the old man gave Zhang Liang a book and said that with it he could become the teacher of kings. Zhang Liang read the book, which was called Tai Gong's Art of War.7 This is what enabled him eventually help Liu Bang establish the Han dynasty. As for qin versions of Yiqiao Jin Lü, altogether they can be found (with some variations in title) in at least 36 handbooks from the present one (Xilutang Qintong, 1525) to Shimengzhai Qinpu (1914).9 There is also a lot of melodic variety within the 35 versions, which range in length from three to nine sections. Most have seven sections or more. The version in Wuzhizhai Qinpu (1722) is of particular note, as it seems to have been the source for many later versions.10 Wuzhizhai Qinpu is also the first to identify it as good for beginners, a claim repeated with some later publications. This aspect is certainly in line with the story of a student achieving success by showing respect for the teacher. There seem to be some modern versions available, but I do not yet know if they were handed down directly or come from reconstruction.14 A version can be found in at least one modern introductory qin book, and online one can find recordings, but I have not yet found transcription and recording together, or a reliable description of the source of the music itself. The (future) Marquis of Liu met the Lord of the Yellow Stone, went for his shoes under the bridge, and received a book called, "The Reader of this is a Teacher of Emperors". Moved, he wrote this (melody). The original section titles, left, do not quite follow the outline of the story in Shi Ji 55. The order at right follows that story, rounded off by giving a separate name for the latter part of Section 7. Order of titles according to the story? No musical references; no mention of 進履 jin lü (though 39827.99 is 進履之謙 Humility of going to fetch the shoes, relating again the same story; the reference here is 漢書張良傳 the biography of Zhang Liang in the Han Shu. For further information on gong mode see Shenpin Gong Yi and Modality in Early Ming Qin Tablature. 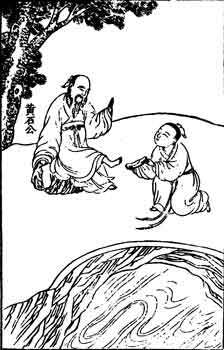 The illustration here of Zhang Liang helping Huangshi Gong with his shoes is from 中國的神仙 Immortals in Ancient China, p. 96. Zhang Liang's biography is in Shi Ji, Annal 55. See Burton Watson, tr, Records of the Grand Historian, Han Dynasty I; HK, 1993, p.100. Zheyin Shizi Qinpu credits Zhang Liang with having created the melody Chu Ge. Part of 沛 Pei district in what is today the Jiangsu/Shandong border region. Presumably 圯橋 the Yiqiao bridge was in this region. 48904.147 calls him a 秦隱士 Qin dynasty recluse, then tells the story with reference to Shi Ji 55 (Zhang Liang/Marquis of Liu, RGH I/99ff), Han Shu 40 高士傳中. In Shi Ji the old man (who is not named) prophesizes success for Zhang Liang, adding that Zhang Liang will see him again in 13 years: as a yellow stone at the foot of 濟北穀城山 Mt. Gucheng in Jibei. He gives Zhang his "Grand Duke's Art of War" (see next) and the prediction proves true. 太公 5965.73ff has nothing related. Watson's translation of Shi Ji 55 calls it Grand Duke's Art of War. The full title of the earliest version, compiled in the Yuan dynasty by 李文蔚 Li Wenwei, is 張子房圯橋進履 Zhang Zifang Yiqiao Jin Lü (Chinese text). The entry in LXS, p.28, says this story was also related in later operas of the same or similar title, as well as other titles such as 赤公記 Chigong Ji. Bio/960 Li Wenwei (no dates give) says he was 元真定人 from Zhending (in Hebei) during the Yuan dynasty, became an official, and wrote such plays as this one and 燕青博魚 Yan Qing Bo Yu. All versions seem to be related, but none seems to include certain distinctive characteristics of 1525 (e.g., none of the others has a short opening section that is repeated, or a purely harmonic section in the middle). A close connection can be heard between this version and what is on some modern recordings. Wuzhizhai melodies led to what may be called the Guangling style. The preface here indentifies it as "韓自十耕原稿 originally copied by Han Shigeng" (韓石耕? ), adding that it was it was "初學入門之法 good for beginning technique". Meanwhile, a note at the front say it was "金陵派 Jinling School". Translation incomplete. My reconstruction of this melody is only in handwritten form - it was one of my earliest efforts, when I thought it was the first surviving version. However, I was never able to play it in a manner that I found convincing, and so I set it aside. The 1525 version seems to me more melodic, but this may reflect more on me than on the versions themselves. Although I have reconstruced and can sing a number of qin songs, I am certainly not an expert singer. In addition, many melodies with lyrics, including (according to my current understanding) the current one, do not seem designed for singing. This is a matter requiring study by experts in this field. This conclusion is tentative, as I have not done complete reconstructions of other versions. I tried the 1539 one before the 1525, and my inability to find structures in 1539 meant that it did not help much when I turned to 1525. In addition, according to a note I once made to myself, an introductory qin book dated 1994 included it, but I cannot now find my reference for this. This commentary accords with the story as outlined above. Re-arrange the sections to follow what seems to be the correct order according to their titles. (Perhaps each section was originally written on a separate sheet of paper, then then somehow they were placed out of order). At least three other versions have section titles, but those titles are completely different from here and so do not shed any light. Examining later tablature might help: if their music follows the same order as the 1525 music as written that could simply mean they followed its misplacement; it would only really be significant if some tablature indicated a melody in the revised order above right.